It is important to ensure that potential tenants have the financial capacity and integrity to pay the monthly rent on time. That’s why most landlords require certification that the tenant has a stable source of income and a good standing in the community before he or she is shortlisted for the tenancy. 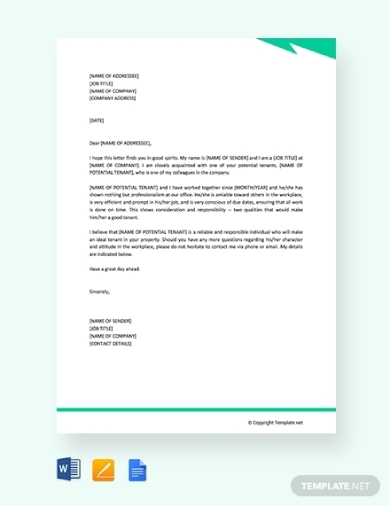 A reference letter is a document that is most often used for this. It can come from an employer, group or community leader, bank, personal friends, and so on. The letter puts into details what’s the tenant’s source of income, how he/she has been financial-wise, his/her integrity as payer, etc. 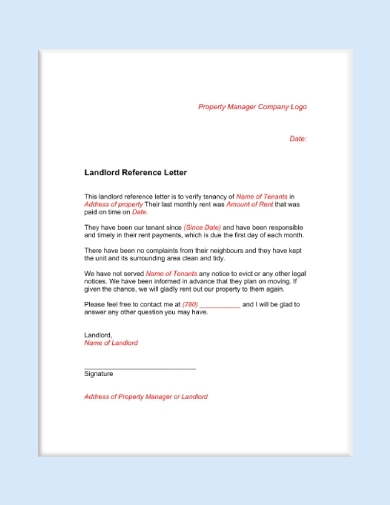 To confirm that a tenant has been living in your property for quite some time and has been a good payer of the monthly rent, you should use a reference letter template. 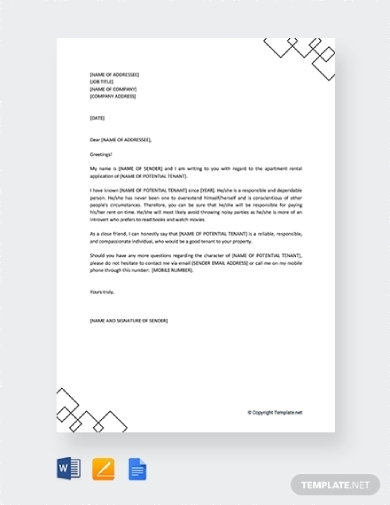 This tenant reference letter template is complete with all the details one should include including the name of the tenant, date of the tenancy, the amount paid, and so on. This document will help attest to the good character of the tenant. A potential tenant will need certification on his or her stable source of income as well as his/her character before he or she can be allowed to rent out a property. With that in mind, an employer is a good person to write a reference letter to help the tenant present all relevant information that will help the landlord approve of his/her tenancy. 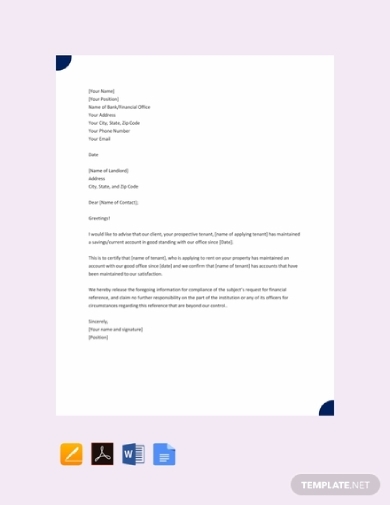 In that case, you can download this reference letter template for free and edit to provide all the actual information needed. As mentioned, a bank or any financial institution can vouch for the financial integrity of a client that wants to rent out an apartment, studio, condominium, etc. 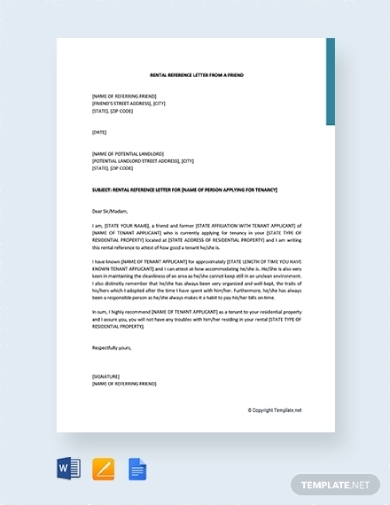 The letter will explain and present information that will confirm that the potential tenant has maintained a savings account, which makes him or her an ideal tenant for the property. 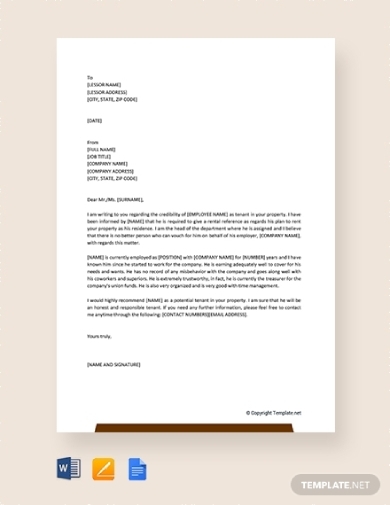 This financial reference letter template can also serve as a cover letter to the other documents as per the client’s request. To help your employee rent out an ideal property for his or her residence, you will need to provide an official reference letter detailing your relationship with the tenant along with information about the name of the company, yours and his or her position, number of years of tenure, and so on. This document will convey a written recommendation on behalf of the interested tenant. Should you need an outline for this, you can download this template for free. Aside from financial independence, a landlord will also need proof that an interested tenant has a good standing in the community. Thus, a character reference letter is a good document that will certify his or her behavior as part of a group or community. This will help the landlord know that the potential tenant is a dependable and responsible person that can be entrusted with taking care of the property and paying the rent on time. Aside from employers and professional acquaintances, your personal friends can also refer you to a landlord should you be interested in renting a place. However, personal friends should have had previous official or professional affiliations with you to make the document more legitimate and factual. The letter will convey information and details about how you are responsible and capable of maintaining a property which will surely have a positive impact on your rental application. If a tenant decides to pursue other transactions that will require an official document, he or she will come to you to ask for certification or proof of tenancy. In that case, as the landlord, you should write a reference letter that will confirm that the tenant truly lives in your property and to certify that the tenant has been a good resident so far. 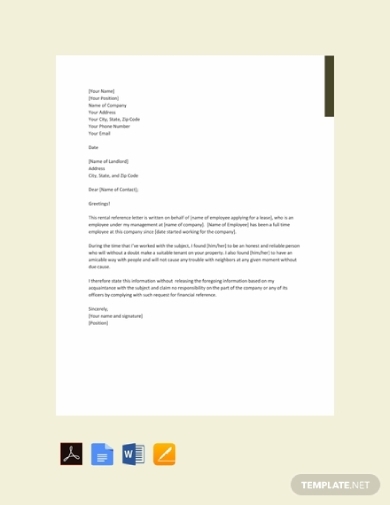 You can download this template to help you get a good head start when you create an apartment rental reference letter. Aside from employers, colleagues are also credible sources to write a reference letter for an interested tenant. The reference letter should contain relevant information about his or her relationship with the interested tenant. Furthermore, it should also include an endorsement of how the tenancy applicant is a good fit for the property. Should you be asked for this task, you can download this template and easily edit to provide all the needed information. Other than a tenancy application, a tenant will also need a reference letter for other business transactions. In that case, you can write a business reference letter to certify that the tenant has been under your tenancy from and to certain dates. As the landlord, you are a credible reference to provide proof that the tenant is responsible and dependable payer and renter. You can use this example as a guide when you are asked to write one for your tenant. 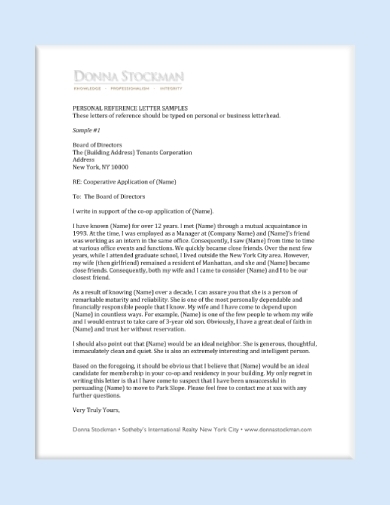 Similar to the previous example, this reference letter recommends or refers a tenant to other business transactions. 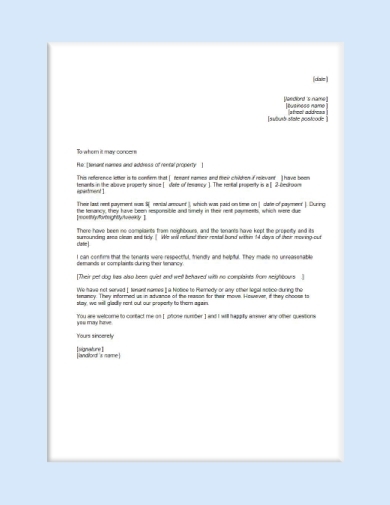 This reference letter puts into details the relationship between you and the tenant, number of years or months of the tenancy, his or her last paid amount for rent, and so on. 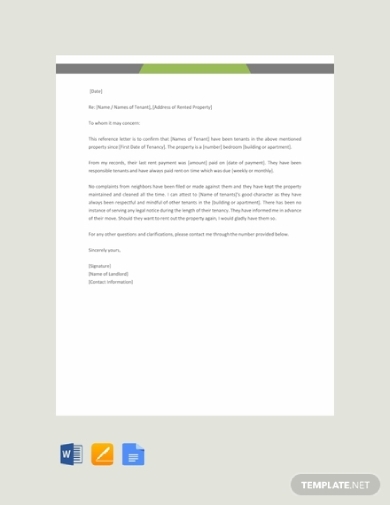 Through this letter, an overview as to how the tenant is as a payer will be given to the recipient. A personal reference letter can be written by a close friend and acquaintance with the aim to provide details and context regarding the character and integrity of the potential tenant. The letter will explain how the writer and tenant have known each other, the tenant’s characteristics, etc. 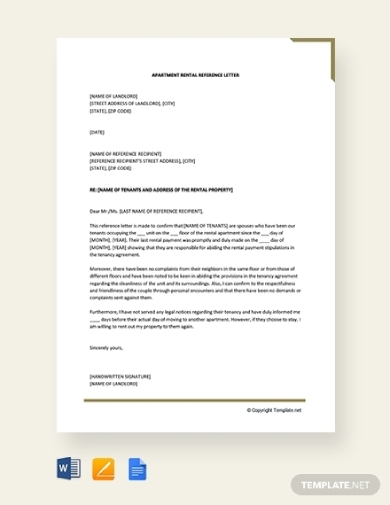 The contents of this reference letter can be cross-examined with the other reference letters that the tenant will provide; thus, this can be a good document to back up the other ones.